Spray it on and let it sit for as long as you want, even overnight! Rub it in, and let it sit. It’s okay to let it dry. Wash with Charlie’s Soap Laundry Liquid or Powder. Repeat if necessary. Follow your garment's care instructions. 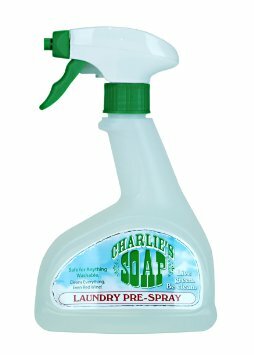 Based on the original Charlie’s Soap formula from way back in the 1970s, Charlie’s Soap Pre-Spray will safely attack just about any stain. Dimensions: 6in. × 6in. × 10in.